WEEK 2 / 8 DURATIONAL PERFORMANCES IN A POSSIBLE ISLAND ? There is a sense of occupation on the 8th floor of the Bangkok Art and Cultural Centre, where A Possible Island ? has run for two full weeks with a consistent and record number of visitors from toddlers, students, elders, locals, and foreigners. 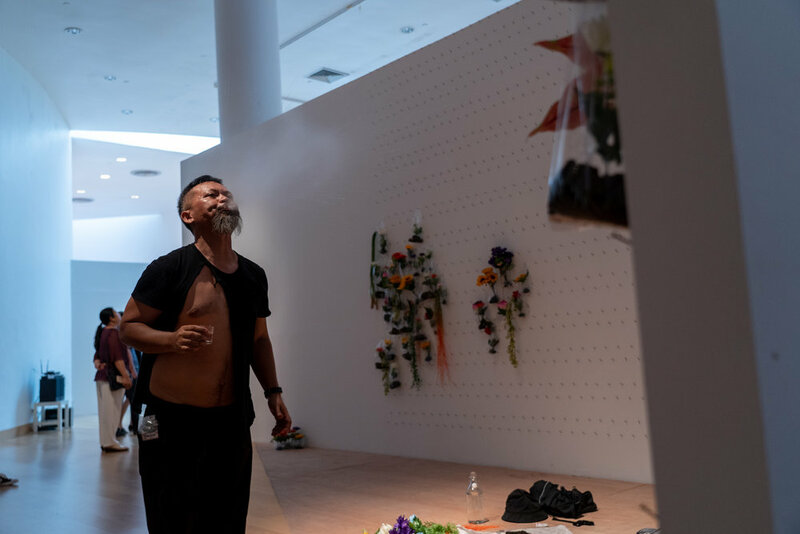 In this second week, we find the 8 durational artists itch towards and explore the boundaries of their performances. How can the artists maintain a dynamic new energy in a worn space, while expanding on their works? 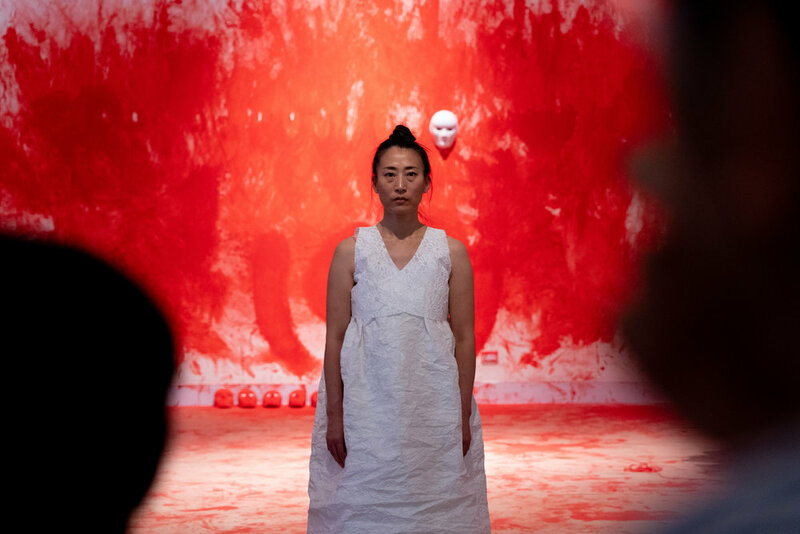 Jihyun Youn’s performance on lamenting demonstrated it could not be contained and represented through her costume. 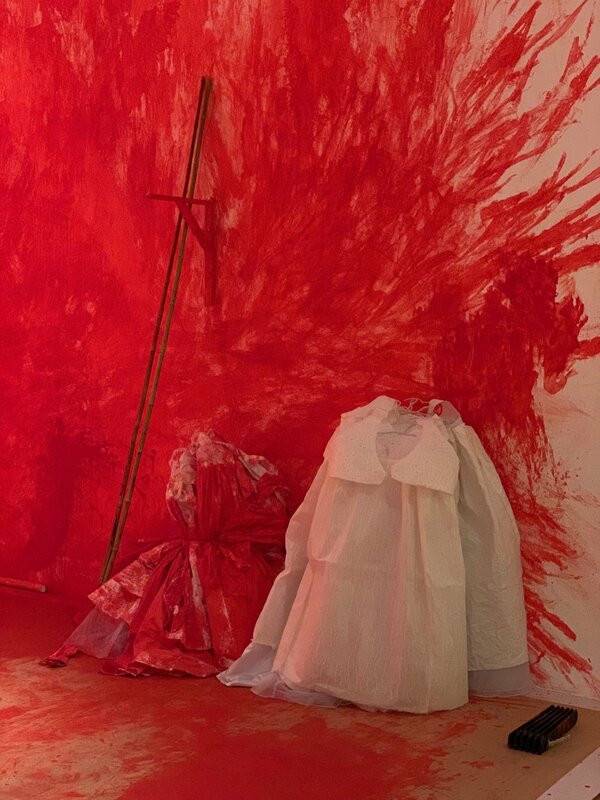 Her body became more red that her dresses, her face without a mask was red, and eventually the entire space was painted red. Her dresses left the rack, somedays creating a barricade between her and the public, and other days stacked in the back. 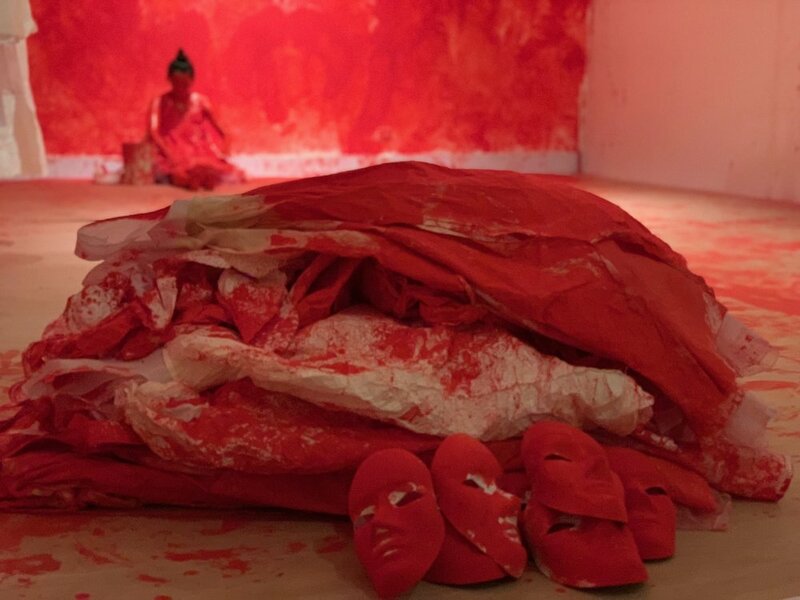 Lin Htet is the only work that remained physically static. He continues to stand and face the public in his cage. His sit in protest is only becoming louder in his silence and his stillness. Through the week, encountering numerous visitors standing with him and looking at him through the eyes, to find tears in their eyes. 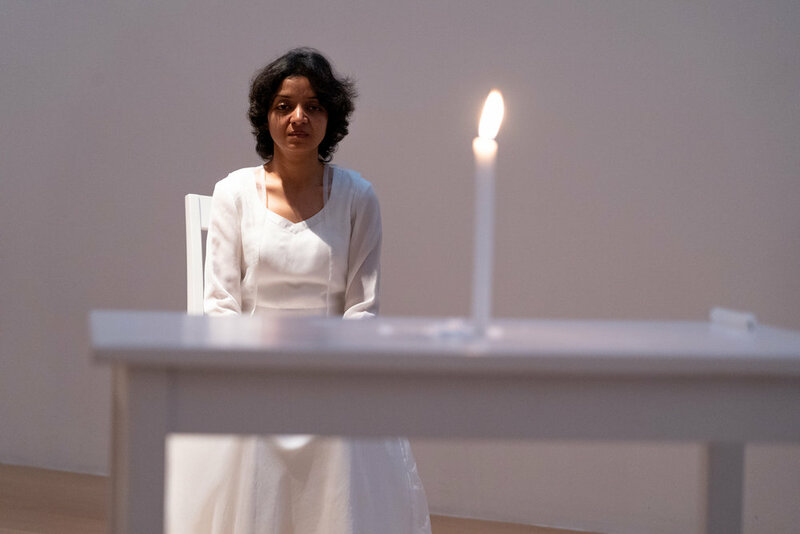 Reetu Sattar expanded the narrative in her work. Stripping down the costume to a simple black short sleeve shirt, black pants, and bare feet, she now spins and sings the names of individuals who have gone missing individuals (evidenced by government abduction): Azucena Villaflor, Esther Carreaga, Faruk Hosen. It is an emotional mourning and a probing of hidden actions by institutions we rely on. 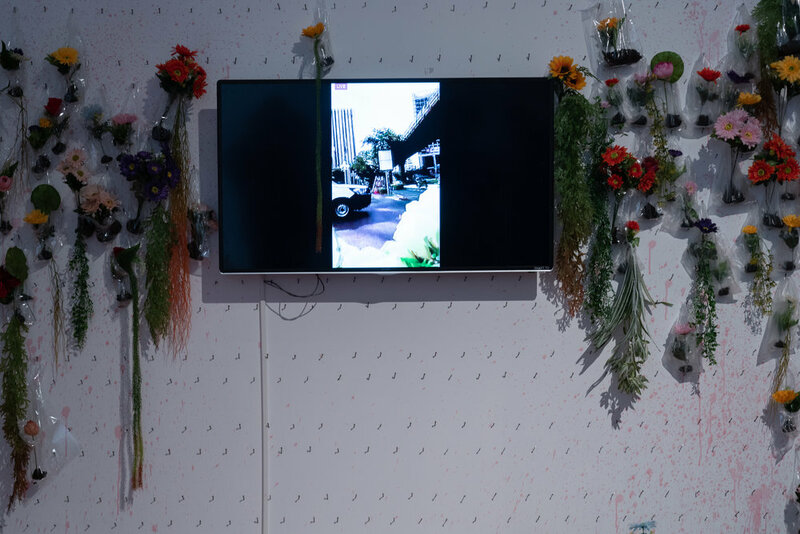 Individuals walk around Despina Zacharopoulou in her enclosed space. They are shy to touch her, at first, and many people who wait in to line and enter her space, do not touch her. The encounter she presents a demonstration of social cues in Bangkok. There is an ‘ice’ to break and she entices the visitors to cross that. 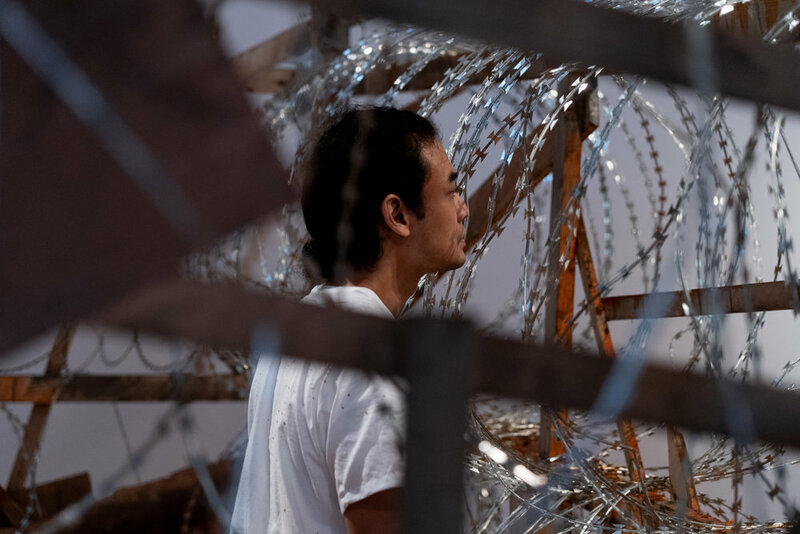 Taweesak Molsawat continues his daily walk, arriving to BACC sooner this week. Perhaps, he has found a route in his routine journey, or maybe it is the drier and more comfortable weather in Thailand. Taweesak’s wall is now nearly fully covered in plastic plants. They begin to cover the TV screen, which projects his walk and with the same dedication, he continues to water them. 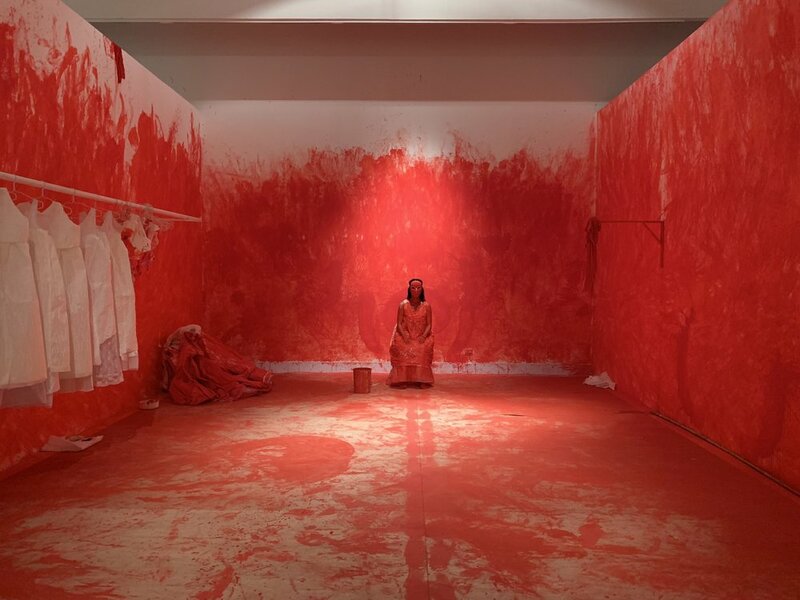 His water in the recent days are dyed with red coloring, a continuation of his iconic play with a serious ritual and what is manufactured. 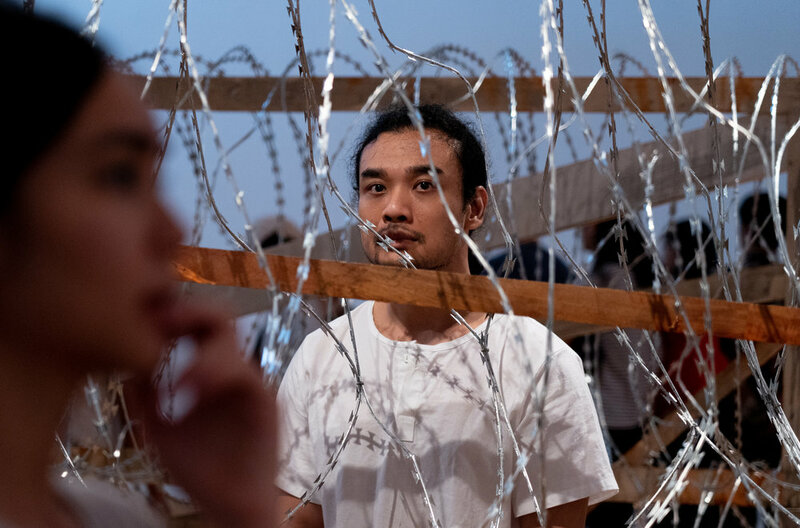 In a more and more entrapping performance, Yiannis Pappas pursues more ambitious plaster casts — at times entire parts of bodies. In one procedure, he wraps the entire length of his right arm and left leg. The removal is surgical and methodical. It is also anticlimactic as his freedom from the structure doesn’t present a satisfaction, but rather represent just another piece of time passing. Pantea’s black square has become a playground and the idea of a circle has become more complex. With the participation of the public, the circle has become decorated. The ‘ring’ is more complex, and where she stands and what role the public plays is coming closer. Watching a candle is the quiet corner with Vandana had never been such an escape. The calmness in this space presents a breathing space for the participants to simply watch the flame on a candle dance.